Dubai has launched a new mega Dhs6.3bn tourism development – Marsa Al Arab – which comprises two islands next to Burj Al Arab in Jumeirah. The project, launched by the UAE’s Vice President and Prime Minister and Dubai’s ruler Sheikh Mohammed bin Rashid Al Maktoum, will be developed by state-owned conglomerate Dubai Holding and managed by its hospitality unit, Jumeirah Group. Spread across 4 million sq ft, Marsa Al Arab comprises two islands located on both sides of Burj Al Arab, and will add 2.2km of beach frontage to Dubai. One island will be dedicated to entertainment and family tourism, while the other will feature an exclusive luxury resort, a statement said. The family resort on the first island will be developed by Jumeirah Group and will introduce “new leisure concepts and services”. As part of the project, the Wild Wadi Waterpark will be relocated closer to the beach. “The new location will grow Wild Wadi’s size by more than twice of its existing size” and it will feature “new thrills, family rides and record breaking attractions”, the statement said. 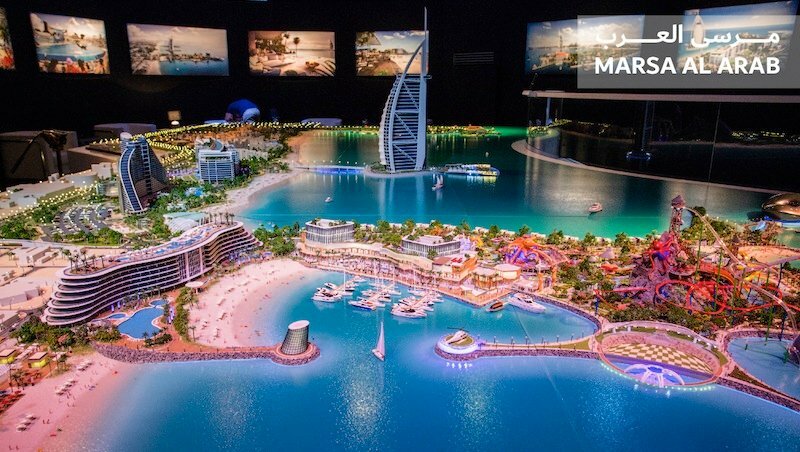 Dubai Holding will also develop a Marine Park, an edutainment centre which will feature a live theatre with a 1,000 seat capacity. The park will also allow visitors to interact with exotic aquatic animals and fish. Together, the enhanced Wild Wadi and Marine Park will be spread across an area of 2.5 million sq ft. The new family destination will also have a theatre with a capacity of 1,700 seats, which will feature shows by popular Canadian entertainment group Cirque du Soleil. Dubai Holding will also launch the Dubai Pearl Museum on the island to showcase rare and ancient pearls from the region and worldwide. The museum will include a functional pearl farm in the adjoining sea, and a pearl-inspired boutique hotel with specialist retail outlets will also be opened at the site. In terms of amenities, Marsa Al Arab will include a private yacht marina and a yacht club, along with food and beverage offerings and a helipad. The project will also include a large retail space stretching across 20,000 sq m, which will replace the current Wild Wadi Water Park area. The shopping centre will consist of international high-end brands, as well as restaurants and coffee shops. Dubai Holding will also set up a mixed-use convention centre equipped to host large international conferences and festivals. The convention centre will be supported by a new hotel, offering services for businessmen and corporates. The overall development will also offer pedestrian pathways, a jogging track, large swimming pool and a cycling course. The new development will feature a signature serviced commercial space aimed at attracting international companies looking to set up base. Marsa Al Arab will also offer 300 sea-front residential apartments. Meanwhile the second private island will house 140 luxury villas – operated by Jumeirah Group – that will offer its residents “complete privacy”. Located on the left of Burj Al Arab, the island will feature a private marina and also host a boutique hotel for elite travellers. Overall, Dubai Holding will add 2,400 hotel rooms to Jumeirah Group’s portfolio, bringing its total offering to 8,428 rooms, the statement said. There will be 400 new F&B outlets throughout the destination. The existing hotels in the neighbourhood are together anticipated to attract 20 million visitors. Jumeirah Group will also offer 10,000 additional parking spaces in the area and work with government entities and other relevant companies to provide a Group Rapid Transit network to interconnect the resorts and entertainment destinations. The project will break ground in June 2017 and will completed by late 2020, the statement said. Marsa Al Arab is expected to further enhance the emirate’s ongoing economic diversification efforts, provide more jobs and support the achievement of Dubai’s Tourism Vision 2020, the statement added. Abdulla Al Habbai, chairman of Dubai Holding said: “Dubai has achieved a global reputation for unique offerings and unprecedented achievements. This was feasible through proper planning and accurate execution of such projects, complemented by in-depth knowledge of the local market’s needs and capabilities.